On Sunday 6th of January our East RDL Sponsor Sony Centre Falkirk invited basketballscotland and its U14 Boys and Girls teams to Glasgow Emirates Arena for the 1st ever Sony Centre Shootout. 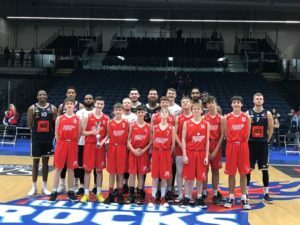 11 teams travelled West to take part in short tournament style games upon the Glasgow Rocks court, set up for their game that evening against Cheshire Phoenix. With over 200 Family and Friends in the stands it was a great atmosphere and venue for our young promising players to showcase their skills. Throughout the day, we saw a great amount of talent, but the winners of The Boys groups were topped by Stirling Knights and the Sony Centre Sponsored side, Falkirk Fury. In the Girls section it was a close match up between the teams involved. With only one Girls group, we saw Falkirk Fury and West Lothian Wolves take the top two spots, progressing them into the final. The finals took place at half time of the Glasgow Rocks BBL Championship match between the home side and Cheshire Phoenix. With a very competitive first half finished it was the turn of our youngsters to show their skills in front of a now 1000 strong crowd. The girls took to the floor first and in a short game, it was the Sony Centre Sponsored girls’ side that raced out to a quick lead and didn’t look back. Taking the game 6-0 and picking up the trophy in front of the Glasgow Rocks. Sony Centre Fury took the clean sweep as the boys controlled their game against Stirling Knights from the tip. The game finished 11-1 in favour of Falkirk seeing them doing the double on a fantastic day of basketball. The Rocks treated the fans and players from the tournament who stayed to watch the game to one they will remember for a while. A put-back right on the buzzer put the Rocks into Overtime where they secured a 5-point win behind stellar performances from Scottish talent and former Fury players Ali Fraser and Kieron Achara. We thank the Glasgow Rocks for their support and opportunity to host this great event at their home venue. The event could not be possible without our sponsor Sony Centre Falkirk and its owner Dean Serafini and we thank him for his continued support to the East Regional Development Leagues.